Are producers of a new Doctor Who spin-off so afraid of fan backlash that they've shut down their official production site? That seems to be the case when it comes to the new, Australian-made K-9 series; the show's website went live earlier this week, giving fans a chance to see behind the scenes of the show before it shoots... and then apparently went offline a few days later. What happened? Although light on pictures of the metal mutt himself – and even lighter on details about the show – there are loads of photos of locations and sets being built. Although one location is identified as Sherwood Forest, we don’t reckon this means there’s a Robin Hood episode, because there is, in fact a Sherwood Forest in Australia as well. No sign of any gravel pits, but it looks like there might be a story set in natural history museum... Seems like this show may be a bigger deal than we were all expecting. 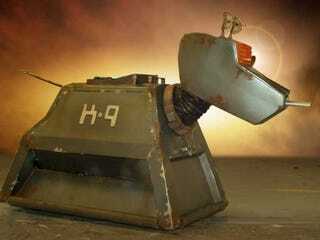 But the design of K9 - who'll allegedly be realised in CGi – still looks a bit naff, if you ask us. Also suddenly present, the sentence "Information on this site is available only to authorised members of the production." So was the initial launch of the site a mistake, and it was always intended only to be available to people working on the show, or was access locked down after news of its existence was leaked online, alongside the word "naff"? We may never know, but one thing is for sure - We're still unconvinced that the world needs a K-9 series at all.